Matrix metalloproteinases (MMPs), especially members of the group of gelatinases (MMP-2 and MMP-9), play a crucial role in the development of endometriosis, since MMP-9 has been shown to be increased in eutopic and ectopic endometrial tissue from women with endometriosis and higher levels of MMP-2, − 9, and − 14 mRNA have been found in endometriotic cells when compared to normal endometrium [5–7]. Furthermore, the concentration of MMP-2 has been shown to be significantly elevated in the serum and peritoneal fluid of women with endometriosis in comparison to healthy women . Consequently MMPs produced by endometriotic cells may degrade the extracellular matrix leading to vascularization and growth of endometriotic lesions and invasion into the peritoneal layer . The pathogenic role of MMP-9 has also been demonstrated in endometrial epithelial cells of patients with endometriosis . Specific inhibitors that exhibit a similar action to the endogenous antagonists, the tissue inhibitors of metalloproteinases (TIMPs), such as ONO-4817, have shown promising results in animal models in the treatment of e.g. endometriosis uteri interna, also known as adenomyosis . However, excessive TIMP levels may also be associated with adverse events leading to reproductive problems  and inhibitors similar to endogenous TIMP may therefore not be suitable for the treatment of endometriosis . However, the roles and interactions of different MMPs in endometriosis are complex and not yet fully understood . Increased MMP-2 and -9 activity is an important characteristic of endometriotic cell infiltration as has been demonstrated in several studies [5, 14, 21–23]. It has been shown in other diseases that subantimicrobial-dose doxycycline is a potent MMP-2 and -9 inhibitor and also decreases expression of pro-MMP-2 and -9 [16, 17]. The expected range of doxycycline in human plasma has been reported at 1–3 μg/ml in pharmacokinetic studies in adults with cystic fibrosis who received doxycycline administered as an MMP inhibitor, a concentration which corresponds to the dose range used in our in vitro experiments . We demonstrate in vitro, that a combination of progesterone treatment with doxycycline can considerably increase the efficacy of progesterone with regards to inhibition of invasion of endometriotic cells. To our knowledge, this is the first study proposing doxycycline in combination with a progestogen as a treatment for endometriosis. To this date, no other studies except of the above mentioned have investigated the effects of doxycycline therapy in endometriosis with exception of clinical studies in which tetracyclines (or ethanol) were injected into endometriotic cysts at high local concentrations for sclerotherapy [29–31]. It is likely that the effect of this treatment may be related to cell damage caused by extremely high local concentrations of doxycycline and this treatment option appears obsolete nowadays. Nevertheless, it demonstrates the potential use of doxycycline in the treatment of endometriosis. It has been demonstrated that progestins reduce the expression and activity of MMP-2 and MMP-9 in human endometrial explants and the inhibitory effect of progesterone on the gelatinases MMP-2/− 9 has been proposed to be mediated by the inhibition of plasminogen activators . 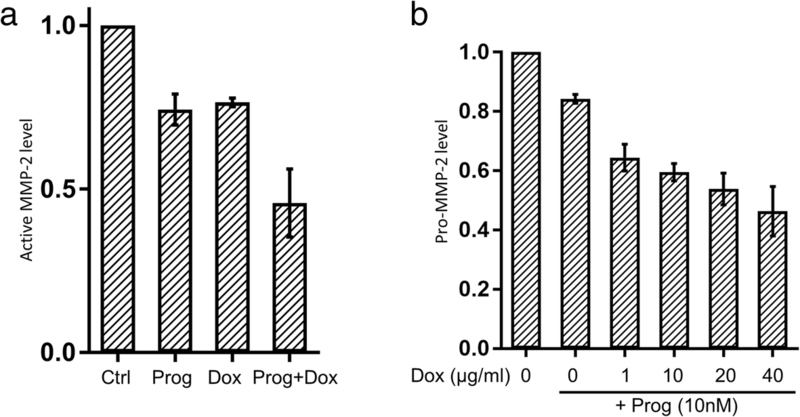 Therefore, the additive effect of progesterone and doxycycline observed in this study may be mediated through distinct and complementary mechanisms that synergistically inhibit the expression and activity of MMP-2. The feasibility and good tolerability of long-term subantimicrobial-dose doxycycline therapy has been demonstrated in the treatment of other diseases such as periodontosis, acne and rosacea. There were no reports of problems with bacterial resistances in the dose level used, and it is assumed that doxycycline does not exhibit antibiotic action in the low (i.e. subantimicrobial) doses used for the purpose of inhibiting the gelatinases, such as subantimicrobial-dose doxycycline (Periostat® 20 mg) used in periodontitis [32–35]. Severe allergic reactions are reportedly to be extremely rare. Doxycycline hyclate 20 mg is contraindicated in nursing mothers, pregnant women and pediatric patients due to potential teratogenic effects and potential severe adverse effects in children. Most of the adverse reactions in adults, including headache, common cold and flu symptoms, nausea, dyspepsia, joint pain and diarrhea, were reported in similar frequency for doxycycline hyclate 20 mg and for placebo .